Iowa State’s first outlying experimental farm was organized in Hancock County in 1930. William Pierre, head of the agronomy department from 1938 to 1964, led the Experiment Station to establish a system of outlying research farms to study local soil and crop problems. Today, the research farm network consists of 12 sites with staff that supports 500 projects, 150 project leaders and hosts 15,000 visitors annually. 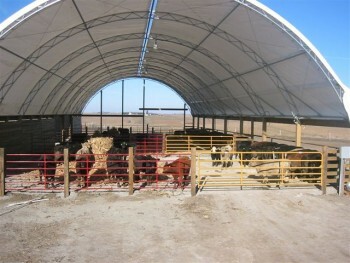 Iowa State designed and constructed one of the first bedded hoop barns for market beef cattle in the United States at the Armstrong Memorial Research and Demonstration Farm near Lewis. The site has been visited by 5,000 people over the last few years. Feasibility and comparative applied research on feeding beef cattle in a bedded hoop barn showed that cattle performed well without the risk of runoff that open feedlots generate. The system has been quickly adopted. A recent survey showed more than 800 hoop barns for beef cattle production have been built in Iowa. The McNay Memorial Research and Demonstration Farm near Chariton has the top Angus bull on the 2013 “YoungSires” list, ranked by muscle marbling by the American Angus Association. McNay’s herd has bulls ranked at one, 22 and 24, with a total of five sires in the top 150. The bulls are the result of ISU’s beef cattle breeding project led by Jim Reecy and Dorian Garrick, animal science. The project pioneered the use of ultrasound to measure marbling in live cattle. The project is actively evaluating beef cattle to produce healthier beef and is a leader in using sequencing of beef cattle genes as a selection tool. The McNay farm has 400 purebred Angus cows. The Muscatine Island Research and Demonstration Farm in Fruitland, got its start helping melon growers who raise muskmelons that bear the name of the area. Thanks to research and outreach by Iowa State, Iowa-grown Muscatine melon yields have increased 400 percent over the past 75 years. The Northern Research and Demonstration Farm in Kanawha is the site for several long-term crop studies, including a rotation experiment that began in 1954. The study examines seven cropping sequences with various nitrogen fertilizer treatments. One conclusion is that including soybean, oats or alfalfa in crop rotations increases corn yield and reduces the need for nitrogen fertilizer. The Field Hydrology Laboratory is located at the Northeast Research and Demonstration Farm near Nashua. This long-term research site has 36 one-acre plots each drained by a separate tile line. Many experiments have been conducted to help explain and understand the relationships of tillage, crop, soil type, precipitation and water quality. Current work focuses on cover crops and livestock manure in cropping systems. The Northwest Research and Demonstration Farm near Sutherland is the site for Iowa’s only runoff experiment studying the effects of corn and soybean production, tillage system, fertilizer or manure on grain yield and the loss of soil and phosphorous with runoff. The long-term study began in 2007 and will generate valuable information on agricultural runoff related to cropping. 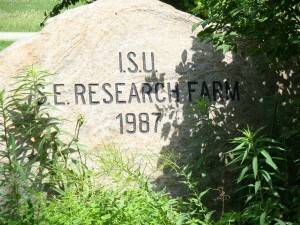 Iowa State’s outlying research farms are visible, productive and relevant. In 2012, the Southeast Research and Demonstration Farm near Crawfordsville celebrated 25 years during which more than 25,000 visitors had come to the farm. Also, the farm had completed 818 different projects and produced 905 pages of research reports. The Western Research and Demonstration Farm near Castana is the site for alternative swine systems research for the rapidly expanding pork niche market. In the early 1990s, Iowa State built its first hoop barn and began applied research on the barns for swine production. These versatile structures, developed in Canada, were largely unknown in the Midwest. Iowans rapidly adopted hoop barns. From 1996 to 2001, 2,100 hoop barns were built in Iowa by 770 pork producers. These barns are capable of producing about 1 million pigs annually — a rapid and significant shift in production technology. A project at the Western Research and Demonstration Farm near Castana investigated converting farrowing house swine mortalities into value-added products using alligators. During the 20-month study, two alligators living in a heated stock tank consumed 382 pounds of swine mortalities as their sole diet, gained 30 pounds and grew 29 inches in length each. The alligators were harvested for meat and hides. Organic crop systems can provide similar yields and much higher economic returns than a conventional corn-soybean rotation, according to 13 years of data from a side-by-side comparison at Iowa State’s Neely-Kinyon Research and Demonstration Farm. The Long-Term Agroecological Research experiment began in 1998 with support from the Leopold Center for Sustainable Agriculture. The project, led by Kathleen Delate, professor in agronomy and horticulture, is one of the longest running replicated comparisons in the country. Iowa State’s new dairy farm opened in fall 2007. The 27-acre complex replaces the Ankeny dairy farm that was about 50 years old. A nearly 100-year-old dairy farm in Ames had closed in 2003. The new facility is a complex of buildings that make up a modern dairy operation, and represents a huge advance in dairy teaching, research and extension for the state. The BioCentury Research Farm is the first facility in the nation with a fully integrated biomass production arm and processing facility. ISU faculty and industry can partner to develop advanced bioreneweable fuels, biobased products and industrial chemicals from grain, agricultural residues and cellulosic crops. The facility opened in 2009. 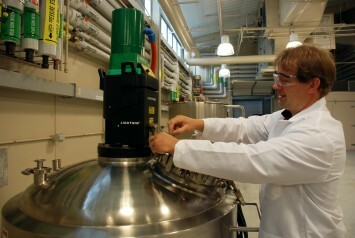 One year later, Biofuels Digest named the BioCentury Research Farm the 2010 Institutional Research Facility of the Year. DuPont is constructing a cellulosic ethanol facility near Nevada, Iowa. Expected to be completed in mid-2014, this more than $200 million facility will be among the first and largest commercial-scale cellulosic biorefineries in the world. It is expected to generate 30 million gallons annually of cellulosic biofuel produced from corn stover residues, a nonfood feedstock that consists of corn stalks and leaves. Matt Darr, assistant professor of agricultural and biosystems engineering, has collaborated with DuPont to improve the productivity of using corn stover for ethanol. Research experiments are based at the BioCentury Research Farm and include a dedicated lab for quantifying corn stover moisture and ash content as well as extensive biomass storage trials. Three hoop structures were built by DuPont to evaluate storage advantages compared to alternative methods such as open storage, tarped storage or enclosed building storage. In 2008, Iowa State constructed a facility for composting organic waste materials from several campus sources, including manure and bedding from the animal science dairy, beef, sheep, swine and equine farms, campus yard waste, campus greenhouse materials, dining services food waste and biomass research wastes from the BioCentury Research Farm. Operations occur under cover of large hoop barns to reduce the risk of runoff and leaching. The finished compost is blended with sand and soil to create amended soil used for campus landscaping and bedding for ISU dairy cows. Also, compost is available to researchers for amending soil in horticultural and agronomic plots. A new algae production facility at Iowa State makes use of an innovative design that’s attracting interest from other universities and private industry. The facility contains a novel biofilm-based cultivation system designed by Martin Gross, a graduate assistant in agricultural and biosystems engineering, and Zhiyou Wen, an associate professor of food science and human nutrition. The cultivation system allows for easy separation of algae from water, which is usually an expensive and time-consuming process. Scientists are exploring the potential for algae as a fertilizer, a source of biofuel and as a feed supplement for production animals, to name a few. Built inside a greenhouse on the BioCentury Research Farm, the facility went online in January 2013 and began filling orders for algae researchers.